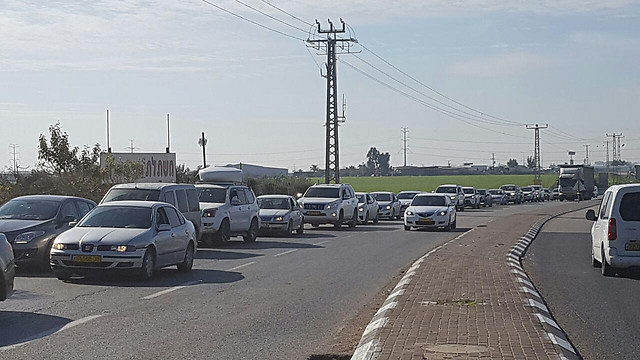 A column of vehicles driving up the road to Jerusalem in protest of the house demolitions in Umm al-Hiran and Qalansawe caused heavy traffic on Highway 1 on Monday. The column of cars was purposefully driving slow—at no more than 20kph—making its way to the Knesset. Heavy traffic was also felt on nearby roads, particularly Highway 3 and the toll road Highway 6. Among the protest’s participants were some Arab MKs, including Jamal Zahalka, Yousef Jabareen, Ahmad Tibi, and Joint List party leader Ayman Odeh. They were also joined by the head of the High Follow-Up Committee for Arab Citizens of Israel, Mohammad Barakeh. “This protest is another step in a series of protests against the demolition of the houses, the killing of Yaqub Abu Alkian (who ran over police officer Erez Levy last week, killing him), and the continued incitement by the minister (Gilad Erdan), the police top command, and (Prime Minister) Netanyahu against the Arab public,” said MK Ahmad Tibi. “We are heading in droves in our vehicles to stop the hatred and incitement. We’re moving en masse to demand recognition to unrecognized villages and a halt to the demolitions. Instead, we demand regulation and expansion (of these villages). We’re going in droves to release the body of the victim, Yaqub Abu Alkian,” Tibi added. While police said Alkian intentionally ran over police officer Erez Levy during clashes in Umm al-Hiran last week, his family and many in the Arab sector insist he was shot, lost control of his vehicle, and consequently ran over the police officer, killing him. Later in the day, a protest is expected at Jerusalem’s Wohl Rose Park while the High Court of Justice is debating on a petition by Alkian’s family. Thousands of people participated on Saturday in a mass protest held in the village of Ar’ara in Wadi Ara against the house demolitions and in solidarity with Alkian’s family. Protesters waved Palestinian flags and called for a stop to home demolitions in the Arab sector and to what they say are lies that Alkian intentionally ran over the police officer. Roi Yanovsky contributed to this report.